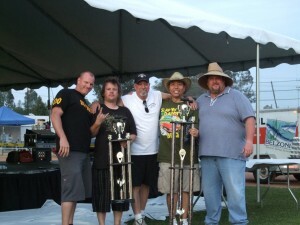 Sweet Double Sweep – TLC BBQ Pitmaster’s Harry from Slap Yo Daddy and his roadie Gary from Notley Que win Grand Champion and Reserve, respectively, at the Ultimate BBQ Showdown East vs West at sunny Wildomar, nestled half way between Los Angeles and San Diego. Notley Q, Otis and the Bird, and Slap Yo Daddy – Top Three Winners! 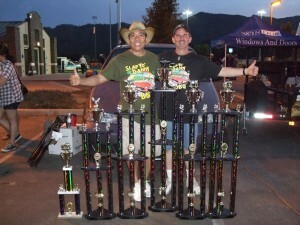 I had Dave Malone from All Sauced Up, California 1st Runner Up Rookie 2009, as my helper this time as my regular partner Mark could not make this event. Several friends and relatives also dropped by to help. 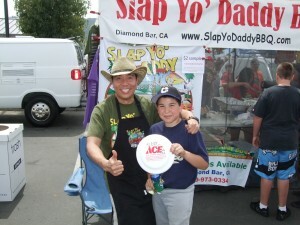 My daughter Amy Soo and my son’s girlfriend Amy Tsang were there to help sell BBQ samples and sell our Slap Yo Daddy tees. We were able to collect several hundred dollars for our two favorite charities: Operation Homefront and Save The Children. 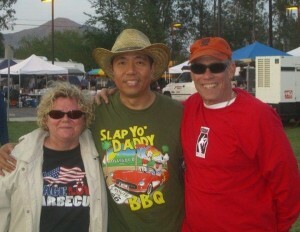 Several teams were also alumni from my popular Slap Yo Daddy BBQ 101 class and it was wonderful to see them get calls. 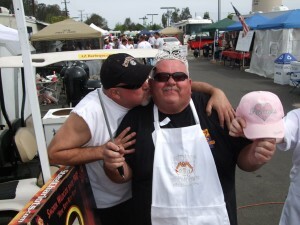 It was great to hang out with our California and Arizona BBQ buddies as the 1 hour between turn-ins allowed for a more relaxed atmosphere and time to shoot the breeze. Our neighbors Chris Rocke from Rancho BBQ invited us for a great breakfast and Mike Reimann frrom AZBBQ cooked us some yummy burgers for lunch. 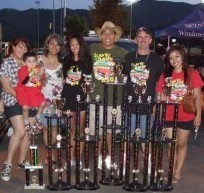 A big thanks goes out to Henry Silvestre for organizing this awesome event. Thanks goes to Kelly and Kathleen for officiating and to all the Rotary Club helpers and volunteers.